U.S. Capitol Building from the Senate side. The United States Capitol is the capitol building that serves as the location for the United States Congress, the legislative branch of the U.S. federal government. It is located in Washington, D.C., on top of Capitol Hill at the east end of the National Mall. 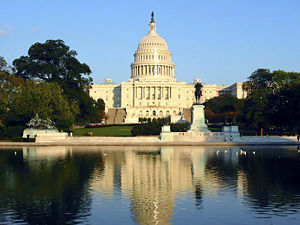 Although not in the geographic center of the District of Columbia, the Capitol is the focus by which the quadrants of the district are divided. The building was originally designed by William Thornton. This plan was subsequently modified by Benjamin Latrobe and then Charles Bulfinch. The current dome and the House and Senate wings were designed by Thomas U. Walter and August Schoenborn, a German immigrant, and were completed under the supervision of Edward Clark. The building is marked by its central dome above a rotunda and two wings, one for each chamber of Congress: the north wing is the Senate chamber and the south wing is the House of Representatives chamber. Above these chambers are galleries where people can watch the Senate and House of Representatives. It is an example of the Neoclassical architecture style. The Capitol, as well as the grounds of Capitol Hill, have played host to major events. Every year since 1990, people gather on the west lawn on the Sunday before Memorial Day for the National Memorial Day Concert. Every July 4, people gather on Capitol Hill to celebrate Independence Day. The U.S. Capitol is also the site of Presidential inaugurations and notable Americans lying in state. The Capitol lies adjacent to Capitol Hill, the neighborhood that is the residence of many of those in Congress. Prior to 1800, at a least eight other buildings and eight other cities have hosted Congress, going back to the First Continental Congress. Since the ratification of the United States Constitution, Congress has only met in two other buildings. The Senate and House of Representatives each have met in various chambers within the U.S. Capitol building, including during expansions and renovations. The capitol was first located in New York. The site for the United States Capitol chosen by Pierre Charles L'Enfant was Jenkins Hill, which rose 88 feet above the Potomac River. The site is one mile from the White House. In 1792, a contest was announced by Commissioners of the Federal City seeking designs for both the Congress House and the President's House. A late submission by amateur architect, William Thornton, was selected by President George Washington. Pierre-Charles L'Enfant secured the lease of quarries at Wigginton Island and along Aquia Creek in Virginia for use in the foundations and outer walls of the Capitol in November 1791. Adorned in masonic attire, George Washington laid the cornerstone on September 18, 1793 during a groundbreaking ceremony for construction of the Capitol. The Senate wing was completed in 1800, while the House wing was completed in 1811. However, the House of Representatives moved into the House wing in 1807. Though the building was incomplete, The Capitol held its first session of United States Congress on November 17, 1800. The legislature was moved to Washington prematurely, at the urging of President John Adams in hopes of securing enough Southern votes to be re-elected for a second term as president. The Supreme Court also met in the Capitol until its own building (behind the East Front) was completed in 1935. Shortly after completion, the capitol was partially burned by the British during the War of 1812. Reconstruction began in 1815 and was completed by 1830. Architect Benjamin Latrobe is principally connected with the original construction and many innovative interior features; his successor, Charles Bulfinch, also played a major role. The building was expanded dramatically in the 1850s. The original timber-framed dome of 1818 would no longer be appropriately scaled. Thomas U. Walter was responsible for the wing extensions and the "wedding cake" cast-iron dome, three times the height of the original dome and 100 feet in diameter, which had to be supported on the existing masonry piers. Like Mansart's dome at Les Invalides (which he had visited in 1838), Walter's dome is double, with a large oculus in the inner dome, through which is seen The Apotheosis of Washington painted on a shell suspended from the supporting ribs, which also support the visible exterior structure and the tholos that supports the Freedom, a colossal statue that was added to the top of the dome in 1863. When the dome of the Capitol was finally completed, it was significantly larger than the original plan, and its massive visual weight overpowered the proportions of the columns of the East Portico, built in 1828. The East Front of the Capitol building was rebuilt in 1904, following a design of the architects Carrère and Hastings, who also designed the Senate and House office buildings. A marble duplicate of the sandstone East Front was built 33.5 feet from the old Front during 1958-1962, and a connecting extension incorporated what formerly was an outside wall as an inside wall. In the process, the Corinthian columns were removed, and landscape designer Russell Page created a suitable setting for them in a large meadow at the National Arboretum, where they are combined with a reflecting pool in an ensemble that reminds some visitors of Persepolis. The Capitol draws heavily from other notable buildings, especially churches and landmarks in Europe, including the dome of St. Peter's Basilica in the Vatican, and St. Paul's Cathedral in London. On the roofs of the Senate and House Chambers are flagpoles that fly the U.S. flag when either is in session. Underground tunnels (and even a private underground railway) connect the main Capitol building with each of the Congressional Office Buildings in the surrounding complex. All rooms in the Capitol are designated as either S (for Senate) or H (for House), depending on whether they are north (Senate) or south (House) of the Rotunda. Similarly, rooms in the Congressional office buildings are designated as HOB (for House Office Building, which are all south of the Capitol) or SOB (for Senate Office Building, which are all north of the Capitol). Additionally, all addresses in Washington, D.C. are designated NE, NW, SE, or SW, in relationship to the Rotunda. The new underground facility will provide a grand entrance hall, a visitors theater, room for exhibits, and dining and restroom facilities, in addition to space for building necessities such as an underground service tunnel. The Capitol Grounds cover approximately 274 acres, with the grounds proper consisting mostly of lawns, walkways, streets, drives, and planting areas. The current grounds were designed by noted American landscape architect Frederick Law Olmsted, who planned the expansion and landscaping performed from 1874 to 1892. In 1875, as one of his first recommendations, Olmsted proposed the construction of the marble terraces on the north, west, and south sides of the building that exist today. Olmstead also designed the Summer House, the open-air, brick building that sits just north of the Capitol. Three arches open into the hexagonal structure, which encloses a fountain and 22 brick chairs. A fourth wall holds a small window that looks onto an artificial grotto. Built between 1879 and 1881, the Summer House was intended to answer complaints that visitors to the Capitol had no place to sit and no place to water their horses and themselves. Modern drinking fountains have since replaced Olmsted's fountain for the latter purpose. Olmsted intended to build a second, matching Summer House on the southern side of the Capitol, but Congressional objections led to the project's cancellation. Up to four U.S. flags can be seen flying over the Capitol. Two flagpoles are at the base of the dome on the East and West front. These flagpoles have flown the flag day and night since World War I. The other two flagpoles are above the North and South wings of the building and fly only when the chamber below is in session. The flag above the House of Representatives is raised and lowered by pages. Several auxiliary flagpoles, to the west of the dome and invisible from the ground, are used to meet Members' requests for flags flown over the Capitol. Constituents of Members of Congress pay to have a U.S. flag flown over the Capitol for a short time to commemorate a variety of events (death of a veteran family member, birthdays, etc.). The fresco painted on interior of the Capitol's dome titled the Apotehosis of Washington was painted by Constantino Brumidi. The Capitol has a long history in American art, beginning in 1856 with Italian-American artist Constantino Brumidi and his murals in the hallways of the first floor of the Senate side of the Capitol. The murals, known as the Brumidi Corridors, reflect great moments and people in American history. Among the original works are those depicting Benjamin Franklin, John Fitch, Robert Fulton, and events such as the Cession of Louisiana. Also decorating the walls are animals, insects and natural flora indigenous to the United States. Brumidi's design left many spaces open so that future events in American history could be added. Among those added are the Spirit of St. Louis, the Moon Landing, and the Challenger shuttle crew. Brumidi also worked within the Capitol Rotunda. He is responsible for the painting of The Apotheosis of Washington beneath the top of the dome, and also the famous Frieze of American History. The Apotheosis of George Washington was completed in 11 months and painted by Brumidi while suspended nearly 180 feet in the air. 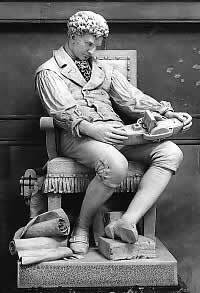 It is said to be the first attempt by America to deify a founding father. Washington is depicted surrounded by 13 maidens in an inner ring with many Greek and Roman gods and goddesses below him in a second ring. The frieze is located around the inside of the base of the dome and is a chronological, pictorial history of America from the landing of Christopher Columbus to the Wright Brothers's flight in Kitty Hawk. The frieze was started in 1878 and was not completed until 1953, and was therefore painted by four different artists: Brumidi, Filippo Castoggini, Charles Ayer Whipple, and Allyn Cox. The final scenes depicted in the fresco had not yet occurred when Brumidi began his Frieze of American History. Within the Rotunda is also located eight paintings of the development of America as a nation. On the east side are four paintings depicting major events in the discovery of America. On the west are four paintings depicting the founding of the American Nation. The east-side paintings include The Baptism of Pocahontas by John Gadsby Chapman, The Embarkation of the Pilgrims by Robert W. Weir, The Discovery of the Mississippi by William H. Powell, and The Landing of Columbus by John Vanderlyn. A marble statue of Robert Fulton by Howard Roberts in Statuary Hall. 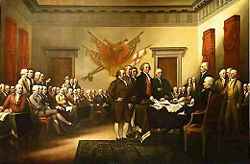 On the west side is The Declaration of Independence, The Surrender of General Burgoyne, The Surrender of Lord Cornwallis, and General George Washington Resigning His Commission, all painted by John Trumbull, a contemporary of America's founding fathers and a participant in the American Revolutionary War. In fact, Trumbull painted himself into The Surrender of Lord Cornwallis. The Capitol also houses the National Statuary Hall Collection comprising statues donated by the 50 states to honor persons notable in their histories. Under the Rotunda there is an area known as the Crypt. It was designed to look down on the final resting place of George Washington in the tomb below. At the request of his wife, Martha, however, Washington was buried at Mount Vernon, and as such the area remains open to visitors. The Crypt now houses exhibits on the history of the Capitol. A star inlaid in the floor marks the point at which Washington D.C. is divided into its four quadrants, however, the exact center of the city lies near the White House. At one end of the room near the Old Supreme Court is a statue of John C. Calhoun. Rows of bollards, line the Capitol grounds for security. Since the mid-twentieth century, the Capitol has been the scene of several security breaches and terrorist attacks. In 1954, Puerto Rican nationalists opened fire on members of Congress from the visitors gallery. In 1971, a bomb exploded on the ground floor, placed by a new left group called the Weather Underground or Weatherman. They placed the bomb as a demonstration against U.S. involvement in Laos. On November 7, 1983, the John Brown Anti-Klan Committee claimed responsibility for a bomb that detonated in the lobby outside the office of Senate Minority Leader Robert Byrd. On July 24, 1998, Russell Eugene Weston Jr. burst into the Capitol and opened fire, killing two United States Capitol Police officers. The Capitol building is believed to have been the intended target of the hijacked United Airlines Flight 93 on September 11, 2001, before it crashed in Somerset County, Pennsylvania after passengers tried to take over control of the plane from hijackers, although some believe Flight 93's target was the White House. 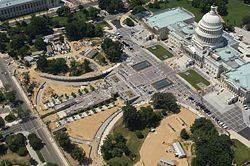 Since the September 11, 2001 attacks, the roads and grounds around the U.S. Capitol Building have undergone dramatic changes. Most notably, construction is well underway on an underground, three-level, 580,000 square foot United States Capitol Visitor Center by the east face of the Capitol. The estimated final cost as of March 2007 is about $600 million. The Capitol, as well as the grounds of Capitol Hill, have played host to major events. 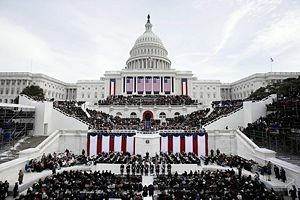 Presidential inaugurations are held every four years on the West Steps of the Capitol, and the both the East and West Steps have been the site of numerous political rallies. Every year since 1990, people gather on the west lawn on the Sunday before Memorial Day for the National Memorial Day Concert, typically broadcast on PBS. Every July 4, people gather on Washington Mall between the Capitol and the Washington Monument to celebrate Independence Day. Senator Henry Clay (1852), the first person to lie in state at the Capitol. Civil rights icon Rosa Parks: the first woman and second African American to lie in honor in the Capitol (2005). 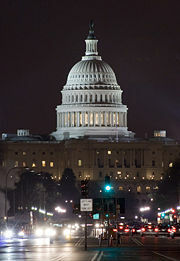 The Capitol as seen from Pennsylvania Avenue at night. Capitol Hill, aside from being the common nickname for the United States Congress, is the largest historic residential neighborhood in Washington, D.C., stretching easterly behind the U.S. Capitol along wide avenues. It is one of the oldest residential communities in Washington, and with roughly 30,000 people in just under two square miles, it is one of the most dense neighborhoods in Washington. The neighborhood that is now called Capitol Hill began when the government began work at two locations, the U.S. Capitol and the Washington Navy Yard, and came to be a distinct community between 1799 and 1810 as the federal government became a major employer. The first stage in its early history was that a boarding house community developed for members of Congress. In the early years of the Republic, few Congressmen wished to establish permanent residence in the city. Instead, most preferred to live in boarding houses within walking distance of the Capitol. 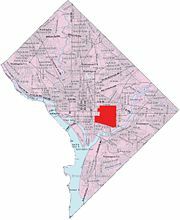 Map shows Capitol Hill in red. The Hill itself rises in the center of D.C. and extends eastward. The hill, which in 1790 was called Jenkins Hill or Jenkins Heights, was the site chosen by Pierre L'Enfant for the placement of the "Congress House," a site which L'Enfant characterized as a "pedestal waiting for a superstructure." In accordance with this plan, the Capitol was situated upon the crest of the hill facing the city. In 1976, the Capitol Hill Historic District was placed on the National Register of Historic Places, and is one of the largest historic districts in the United States. It includes buildings from the Federal period (1800 to 1820) through 1919, but most of the buildings are late Victorian. Like most of Washington DC, Capitol Hill is predominantly African-American but has remained a fairly stable, middle-class neighborhood throughout its existence. In the 1970s and 1980s, its fringes were often affected by a high crime rate and drug problems. However, more recently, the neighborhood has undergone intense gentrification. ↑ washingtonpost.com. www.washingtonpost.com. Retrieved July 13, 2007. All links retrieved December 28, 2015. United States Capitol Historical Society – www.uschs.org. Architect of the Capitol – www.aoc.gov. Capitol Hill Historic District — www.cr.nps.gov. This page was last modified on 28 December 2015, at 16:51.